Coffee and AR: Prepare for impact! This is a draft. A different, final version of this story will appear in Coffee Traveler magazine later this year. If you know of any examples of AR being used in the coffee industry, do let me know! Augmented Reality will soon be everywhere. How can the coffee industry prepare itself for this revolutionary new technology? 2017 can be considered the start of Augmented Reality. Six hundred million iPhones became enabled for AR. One hundred million Android users also gained AR functionality. Facebook, Microsoft, Intel and other companies released or improved AR products. Time magazine, in an issue guest-edited by Bill Gates, used AR on its cover. There is no doubt that AR will become a very, very big thing, as common as GPS. But what is AR, Augmented Reality? And, in what ways will AR impact the coffee industry? AR is a technology that combines digital data with the physical world. The digital data can be sound, text, graphics, video or 3D models (like what you see in many computer games.) The ”physical world” can be as large as the Sydney Opera House or as small as a matchbox: books, table tops, living rooms and parks-- anywhere! At present, AR can be experienced with phones and tablets, though special glasses, like Microsoft’s Hololens or Google Glass may become common. AR is used for industrial, educational, medical, entertainment,research and other purposes. The first huge AR success was Pokemon GO, which hides digital creatures in real world locations. With Ikea’s AR app, customers can put digital furniture in their real homes, allowing them to select the best color and size. Coca Cola and Boeing, like many companies, use AR to aid in the repair and maintenance of machinery. An Australian wine company called 19 Crimes created an app that allows the photographs on their labels to move, speak and tell stories. According to Forbes magazine, this AR app resulted in over one million cases of wine being sold, and an increase of volume sales by 60%. AR is nearly unlimited; it can play audio, interact with users, function like GPS, display graphics, photos, videos and more. AR gamers fight flying spaceship battles in their bedrooms. In restaurants, menu applications by KabaQ display AR models of food. 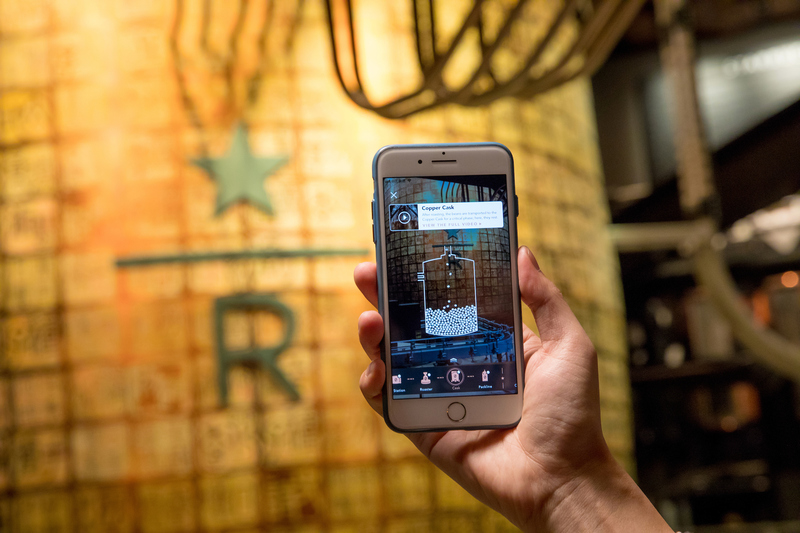 Starbucks, whose first AR project was launched in 2011, recently created a “coffee wonderland” in Shanghai. Called the Roastery, it features a number of AR experiences. Its centerpiece is a huge copper vessel covered with almost three thousand hand carved Chinese seals that tell the story of Starbucks. 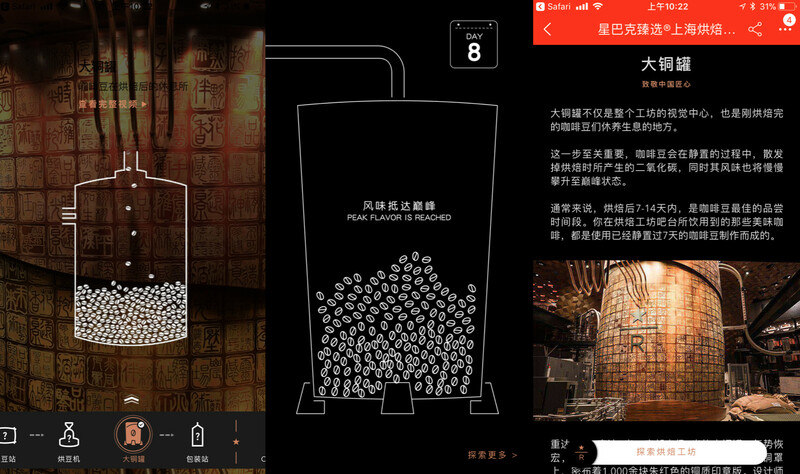 Using AR, visitors can “look inside” the huge structure, and see the beans being poured in, roasted, and then finally transported through copper pipes to the coffee bars. Because they have come to the Roastery specifically to experience,and learn about coffee, visitors are likely to download the digital tour guide. There is also a QR code version. When planning to make an AR app, the first issue is: download or not? The second being the Apple/Android issue. It is a wonderful idea to create a customized AR app, what is called a “native” app. However, potential users may be discouraged by file size and download time. A native app may not be the best choice at trade shows or public spaces without high speed wifi. Fortunately, not all AR requires a native app. And, there is WebAR, which works on both Apple and Android and does not requirea download, only a link. 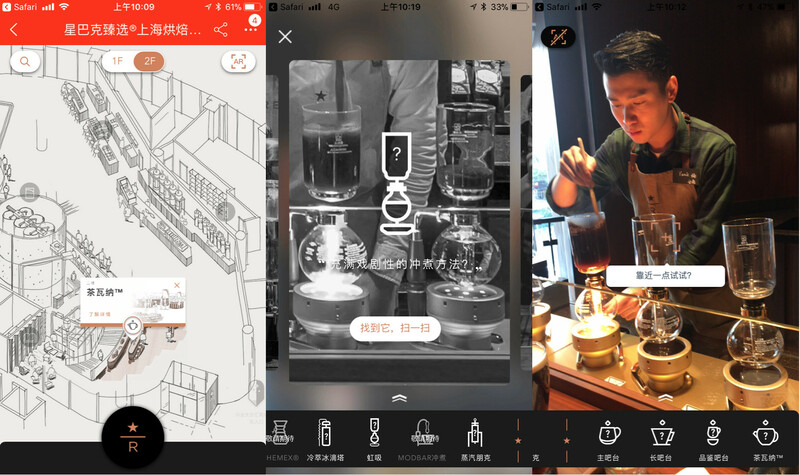 The Roastery chose AR because it was the best solution-- not because AR is trendy. Perhaps they could have used video monitors- but how many? And where to position them? Plus, visitors would not be able to pause, replay or start the presentation. Location: companies with big budgets can create AR experiences for large spaces. Snapchat put giant AR sculptures by Jeff Koons in front of the Eiffel Tower and in Central Park. Waterloo Station was the site of an AR game created by Cadbury, and AR rhinos roamed in the Rotterdam train station, thanks to National Geographic. Augmented Reality is now used in homes, factories, airplanes, and living rooms. It is becoming a new medium, like radio or television. AR is becoming an artform and, in advertising, AR is connecting producers and consumers in new ways. It will be interesting to watch the seeds of AR grow in the world of coffee. This entry was posted in AR, Stephen Black and tagged AR. Bookmark the permalink. 2 Responses to Coffee and AR: Prepare for impact!